Prime Minister Benjamin Netanyahu of Israel told the United Nations on Thursday that his intelligence agents had discovered a “secret atomic warehouse” in downtown Tehran, escalating a growing confrontation with Iran and setting up a direct challenge to its government to open the facility to inspectors and prove it is not in violation of the 2015 nuclear deal. A group of young Iranian men wasted no time and visited this so-called nowhere land right after Netanyahu’s speech. “Don’t bother coming here—there’s nothing here,” they laugh in a video popularly shared on social media. Since the video, Iranians are now using the Persian carpet cleaning facility site as an opportunity to post selfies. At least two were featured on the frontpage of Iranian newspapers. Even the Chief of Staff for the Armed Forces, Major General Mohammad Bagheri, weighed-in on the speech on Twitter with the Persian hashtag #Torquzabad and a photo of himself and other high ranking officials laughing. A U.S. official, speaking on condition of anonymity, said the United States is aware of the facility Netanyahu announced and described it as a “warehouse” used to store “records and archives” from Iran’s nuclear program. Netanyahu’s claim that the facility held “massive amounts of equipment and material” appears to be completely unfounded. The IAEA doesn’t need to inspect this site because there is no reason to think that there is anything there. Netanyahu has made a habit of making false and overblown claims about Iran’s nuclear program for decades. He has been consistently wrong about Iran’s nuclear program, but his statements continue to be taken seriously in the West. 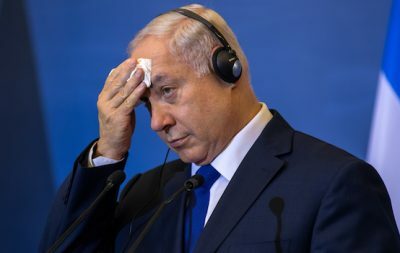 Netanyahu keeps trying to mislead the world into believing his alarmism about Iran’s nuclear program, but his warnings have been so wrong for so long that Western audiences should know by now to stop listening to him. Featured image is from Ververidis Vasilis /shutterstock.